Former President Olusegun Obasanjo reaffirmed his anti-President Muhammadu Buhari battle yesterday in Lagos when he said only a popular movement can enthrone a progressive leadership required to make Nigeria a great country. He said Nigeria had disappointed Africa in providing needed leadership in post-military era. Although, the ex-president did not specifically mention any regime, he said the nation deserved a better leadership to enable it play a front role in Africa’s socio-economic growth. He said the way out of the development quagmire is for the masses to form non-partisan “popular movement” that would serve as a credible alternative. The former president spoke yesterday at the 15th Lecture and International Leadership Symposium with the theme: Leadership and Performance in Africa: The Challenge of the Continent’s Economic Competitiveness, organised by Centre for Value Leadership (CVL) at Muson Centre, Onikan, Lagos. CVL is a leadership think-tank founded by Prof. Pat Utomi. Obasanjo said: “The first generation of leaders in this country, whatever you say about them, gave us independence. They helped in the transition from colonial power to indigenous leadership. Within their knowledge, their experience and exposure, these first generation of leaders did their best. But then, they made mistake, which led to the transition to the military era. Later, there was another transition to democracy. The ex-president also said security matter should not be politicised or treated as emotional issue, noting that insecurity does not recognise anyone’s emotion or cultural beliefs. Obasanjo said he disagreed with a statement credited to former United States (U.S.) President Barack Obama, who said Africa needed to build strong institutions and not strong men. “I believe we need both strong institutions and strong leaders. If there are no strong leaders, we will not be able to build strong institutions. If strong institutions are established and our leaders are weak, those strong institutions will collapse,” Obasanjo said. 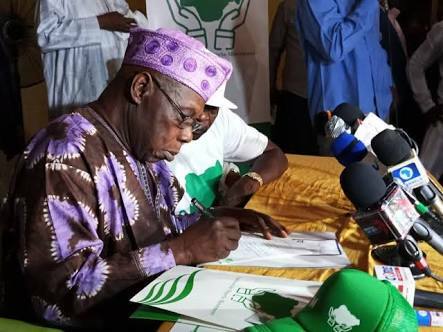 In a special statement last month, Obasanjo discredited the two main political parties – the All Progressives Congress (APC) and the Peoples Democratic Party (PDP). He went ahead to form the Coalition for Nigeria Movement.